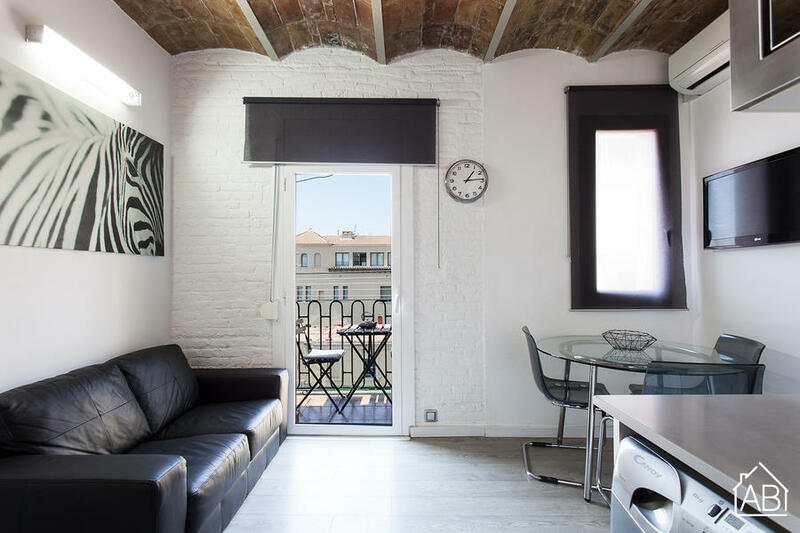 Located in the beautiful neighborhood of Barceloneta, this charming two-bedroom apartment in Barcelona is an ideal base for your trip to the Catalan capital. This area grants guests easy access to the many bars, cafés and restaurants that line the beachfront. And with historic downtown a short stroll away, the city of Barcelona will be at your fingertips! With space for up to three people, this warm and welcoming apartment is a great choice for couples or families visiting the city. The apartment enjoys a traditional feel, with the open-faced brick walls, parquet flooring and dark wooden furniture throughout, all adding to the ambience of this lovely apartment. The living room is furnished with a comfy double sofa, and a TV, perfect for relaxing after a day of sightseeing. The large French window allows for natural light to fill the space throughout the day between the hours of 12PM and 8PM, and also opens up onto a balcony, from where you can enjoy views of the sea and the beach, as well as soak in the vibrant life that is abundant in this neighborhood. The modern kitchen is fully equipped, making it possible for you to create your very own home-cooked meals, or try your hand at some Mediterranean inspired dishes. The main bedroom has a comfortable double sofa bed, while two single beds can be found in the second bedroom. The apartment has one bathroom with a walk-in shower. Complete with heaters, this lovely apartment is the perfect home-away-from-home for your trip to Barcelona, and will ensure a comfortable stay, any time of the year! Available PARKING for 25 euros by day.